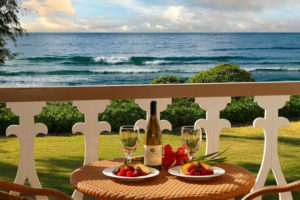 Kauai is an incredible and rejuvenating escape – one that we highly recommend every person to visit at least once in their lives. While there are hundreds of features that make Hawaii such a special place to visit (horseback riding along the Pacific Ocean, cliff diving, helicopter rides, volcano hikes, Jurassic Park shooting locations, Hawaiian coffee, and so on) there is one part of Kauai in particular that has the potential to beat them all. Kauai is known for its majestic and impressive waterfalls. The glorious cascading water is postcard-worthy- a real reflection of why the island is so spectacular. 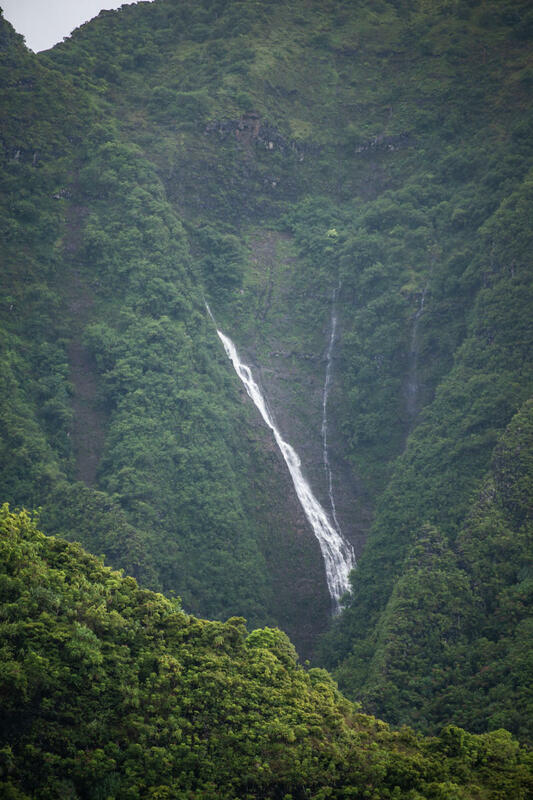 Below are the four best waterfalls to see on Kauai. 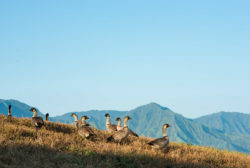 They make the adventure to Kauai mesmerizing and unforgettable. Volcanic eruptions from millions of years ago have turned the cliff side of the Opaekaa stream into one of the top Kauai attractions. Unlike other waterfalls on this list, it is possible to drive right within a reasonable walking distance of the falls. Seeing the falls is free. Local vendors selling hand-crafted jewelry and other gifts may be at the location. You actually can’t hike from the top of the falls to the bottom due to overgrowth and other possible dangers, but the lookout provides a rather spectacular view of the Wailua River. 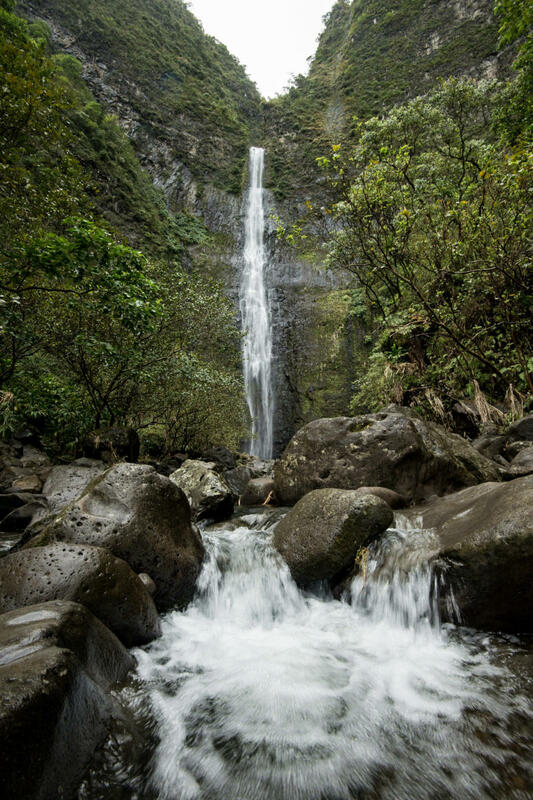 Opaekaa Falls is widely considered the easiest waterfall to get to on Kauai. If you want something accessible and/or you are dealing with issues of mobility, this is the waterfall to see. Secret Falls is about an hour paddle up from the Wailua River Marina. You can use a local paddleboard provider, such as Kayak Kauai, to make the guided trip to the waterfalls. It is also accessible by hiking, but even locals don’t recommend it. An avalanche incident a number of years ago encouraged the island leaders to post signage discouraging non-experienced hiking and alternative routes. If you manage to make it to Secret Falls, whether by kayaking or hiking, you will find a stunning narrow passage drop. A deep hole collects at the bottom where you are bound to find locals and visitors lounging out, eating lunch, and swimming. Though visiting the falls is free, kayak costs vary. You are almost certain to have a guide on the trip. A typical adventure from the marina to the falls totals about four hours. With some water shoes, some food, and a positive attitude, you can appreciate the unending beauty and wonder of Secret Falls. A rainbow hovers the mist surrounding Wailua Falls on Kauai. Wailua Falls is an interesting case for curious visitors. Wailua Falls has a dedicated parking area, but it is quite small. Furthermore, you can only partly see the waterfall from the overlook area by the parking lot due to the overgrowth and vegetation (highly protected by Kauai). With that said, some visitors may wander on down to the waterfall for a better view. The overlook has postage and a fence stopping eager visitors who want a better view, so making your way down the often muddy and extremely steep pathway is extremely discouraged. Regardless, if you visit on a quiet day, you are sure to see the side of a stunning and jaw-dropping waterfall. It is not accessible in any other way, unless you want to take to the skies in a helicopter – and you can. 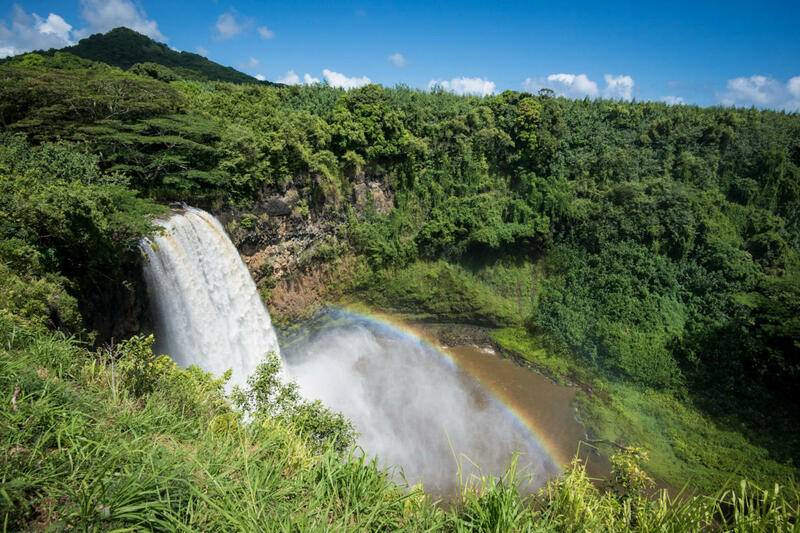 You’ll have to hike to reach Hanakapiai Falls, but you’ll be rewarded with gorgeous views and fewer crowds bathing in the pool below this spectacular scene. Unlike the Opaekaa Falls, which are accessible by parking lot and overlook, and the Secret Falls, which can be found with a modest afternoon kayak trip, Hanakapiai Falls is incredibly secluded. This is the top crown for advanced hikers and ambitious travelers. It’s one of the most beautiful trails that many say is the most incredible hiking experience of their life, and includes incredible sweeping views of the Napali coastline. This is an advanced trail that you want to be equipped to tackle. It is long with plenty of elevation gain along with multiple stream crossings, slippery rocks, and ABSOLUTELY NO CELL SERVICE. You’ll need plenty of water and hiking experience. You might also want a few emergency essentials just in case. You don’t need a guide to get to Hanakapiai Falls, but you should know what you are getting into. The Hanakapiai Trail that takes you to the falls begins at Ke’e Beach and takes you to Hanakapi`ai Beach after about 2 miles, with the option to head to the waterfalls at that point which will take you another 2 miles. It starts with an immediate elevation gain. It is one of the more popular Kauai hiking trails due to the waterfalls, so you’ll likely see many others along the way. The trail can be muddy and slippery at many parts, and it is even worse in the Winter. It isn’t recommended that hikers attempt this trail from November – April because of potential flash flooding during the rainiest months of the year. The hike to the falls is an eight mile round trip, which could take you anywhere from 6 – 9 hours depending on your athleticism. As you close in on the falls, the trail gets denser. You may even be on all fours, clearing rocks and mud paths on your way. From the easy and accessible to the highly ambitious, Kauai waterfalls are stellar, breathtaking and all worthy of a visit, to say the least. 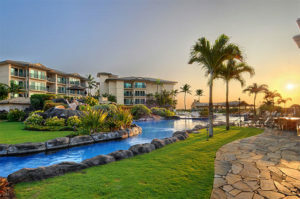 There are plenty of other activities and things to do that don’t require any physical feats whatsoever, and it is completely up to you how you want to experience Hawaii’s Garden Isle! 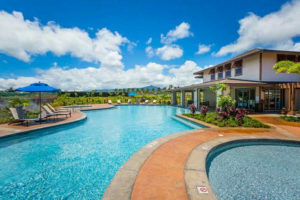 Contact our Waipouli beach resort and spa for information about any of our Pili Mai rentals near these waterfalls and other top attractions on Kauai. Driving Around Kauai – How Long Does It Take?